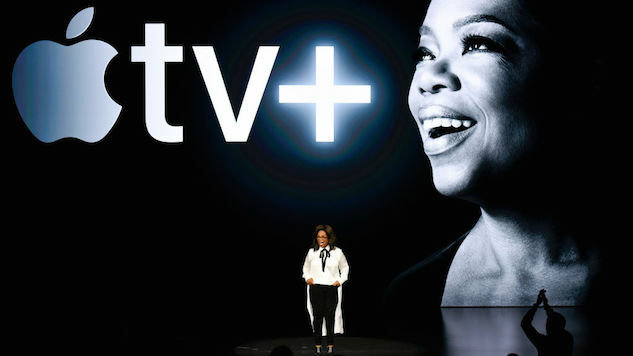 Apple announced the launch of its highly anticipated TV streaming service, Apple TV+, during a star-studded presentation at its corporate campus in Cupertino, Calif. on Monday—an event reminiscent of the broadcast networks’ annual “upfronts” for advertisers. And that may not bode well for the tech giant as it tries to compete with forerunners Netflix, Hulu, and Amazon Prime in the realm of programming. Offering no more than a handful of frames from each of its upcoming original series, including The Morning Show, starring Reese Witherspoon and Jennifer Aniston, and Amazing Stories, an anthology from Steven Spielberg, Apple’s surprisingly stilted exhibition did not suggest a major step forward for streaming TV, nor a particularly novel artistic vision. “They’re in a billion pockets, y’all. A billion pockets,” Winfrey said, explaining why she’s joining forces with Apple, and it’s clear that the company’s reach is one key reason it’s lured so much high-end talent to produce its first wave of original content. (Apple teased projects involving Ron Howard, Octavia Spencer, Hailee Steinfeld, Abrams, Sofia Coppola, and M. Night Shyamalan in a pair of “sizzle reels” bookending the event, but none received a dedicated segment in the presentation.) But coupling major star-wattage with top-notch production values and a breadth of genres/subject areas is straight out of the streaming (and premium cable) playbook: When the goal is attracting subscribers, rather than amassing Nielsen ratings, “something for everyone” tends to be the dominant calculus. In other words, take Apple CEO Tim Cook’s promise that Apple TV+ will be “unlike anything that’s come before” with a Netflix-sized grain of salt. As might be expected from a company that made its mark—and its billions—through hardware, it’s the Apple TV app itself that has the potential to solve a practical problem for viewers—to provide the “service” that Cook defined at the outset, and as he and other speakers referred to throughout. One of the consequences of cord-cutting, skinny bundles, smart TVs, and the streaming wars has been the diffusion of the average viewer’s favorite series across multiple apps on multiple devices. The new Apple TV app, which launches in May, with a rollout on Mac computers and several brands of smart TV thereafter, will combine the iTunes movie catalogue, cable/satellite bundles like Spectrum and DirecTV, and subscription services like HBO, Hulu, and Amazon Prime into a single, personalized “TV channel.” (Netflix, notably, is not included.) It’s not an iPod or iPhone-level game-changer, but the ability to move seamlessly among multiple platforms’ programming options within one app is the sort of streamlined user experience that helped those products land, as Oprah says, in one billion pockets. We won’t know for certain until Apple shows us more of the series themselves, but if swiping is the new channel surfing, as we heard in Cupertino on Monday, Apple’s role in redefining TV seems most likely to be on its home turf—applications and devices—and not Hollywood’s—art.